Click Here to view Glosford’s current standard construction details. Click here to obtain u-value calculations via the Kingspan website. View the most up to date information on product safety here. View the new robust details approved with the SIP building system in terms of acoustic transfer between dwellings for wall types E-WT-1 and E-WT-2. E-WT-2 has now been proven with cavity fill insulation to reduce the impact of thermal bypass in the party wall cavity to a zero value in your SAP calculations, whilst still complying with robust details. 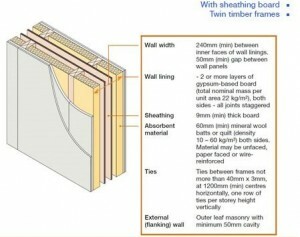 For further information on separating walls click here. Click here to view Glosford’s environmental and sustainability plan. Click here to view a case study on insulation sustainability within the environment. Click here to view further information on the impact of thermal bypass and performance standards. Click here to view Kingspan TEK case studies. Some undertaken by Glosford.